Concrete is composed of gravels, sand, cement and water. It is created by blending these mate-rials in measured amounts and stirring the mixture for a short period of time. The concrete’s main characteristic is the fact that it hardens within a few hours from its casting; moreover it gains a large amount of strength over the initial following days. Depending upon additional properties that the concrete is required to have, special admixtures may be added during the mixing process. These may be retarding admixtures or/and super-plasticizers for improving concrete’s workability or even steel or other composite fibers in order to increase the mixture’s compressive and tensile strength. The classification of concrete strength classes is based on their compressive strength. Each concrete strength class e.g. C30/37 is characterized by two equivalent strengths, which in this specific example are 30 MPa and 37 MPa. 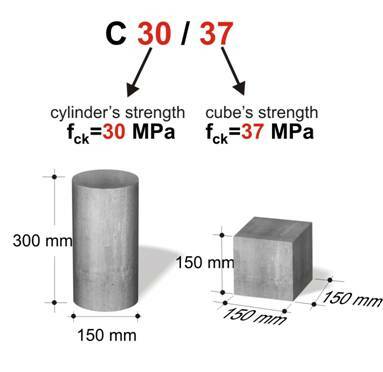 The first is the characteristic strength fck of a stan-dard concrete cylinder[*] NoteThis is the compressive strength used in the design and the latter is the characteristic strength of a standard concrete cube. According to Eurocodes, the minimum suggested concrete strength class is that of C30/37. The protection of reinforcement steel against corrosion depends about its porosity and the qual-ity and the thickness of the concrete coating. The density and quality of the concrete is achieved with the use of the suggested concrete strength class. The following table demonstrates the combination of the suggested coating in conjunction to the concrete strength class for the most usual environmental conditions. • In slabs 5 mm are subtracted. • In case of quality assured concrete production procedure 5 mm are subtracted m.
• In cases of a designed life span for the building of 100 years, 10 mm are added. • In the surfaces of the footings - with cast concrete – that are in contact with the ground and there is an adequate ground formation or a footing mix layer, the minimum coatings must be ≥40 mm. If there is no footing mix layer or ground formation, the minimum coatings must be ≥75 mm. If a concrete strength class of C40/50 with a quality assured production procedure is used, then the minimum coatings are decreased by 5 mm+5 mm=10 mm and thus: 20 mm, 25 mm, 25 mm, 40 mm, as shown in the following shapes. Construction in sea side area with concrete strength class of C40/50 produced with a quality assured production pro-cedure. The regulations and practices mentioned below refer to the Greek CTR-97 (Concrete Technol-ogy Regulation, 1997). This Regulation is valid, in this transitional stage, along with the Euro-pean Standard EN 206-1. The European Standard EN 206-1 is more advanced and has trans-ferred a great amount of responsibility that had to do with building-site procedures, like concrete sampling, to the concrete supplier who of course must be properly certified. The finalization and printing of the ENV 13670-1 is expected to finish soon. It will then substitute the Greek Concrete Regulations (EKOS) for guidelines about formation, compaction etc. of concrete. After a defined limit, the more water the concrete mixture contains, the less its strength and the higher its porosity. Apart from its strength, the concrete is also characterized by its workability. This defines the amount of the water that is going to be used for the production of the mixture. The slump height is the workability criterion of concrete. A specific value of slump height is suggested, depending on the use of the concrete mixture, as shown in the following picture.